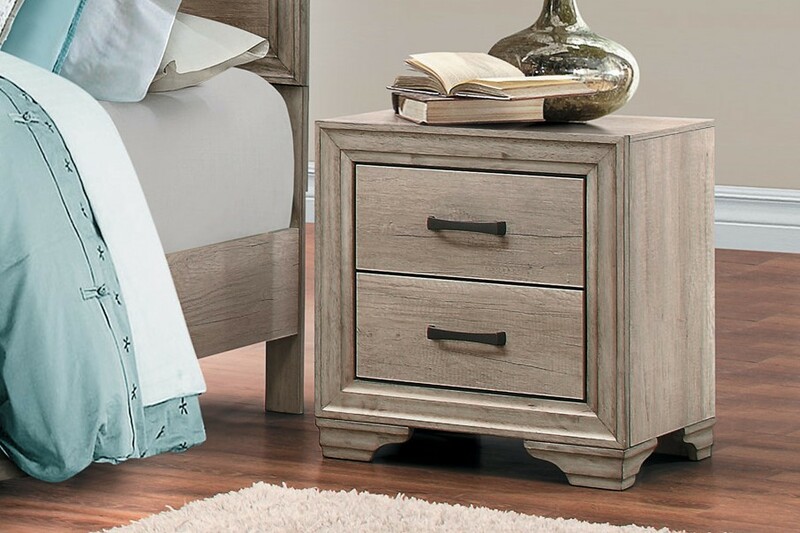 Couch Potato Clearance Lonan Night Stand 22x16x23H<br /><br /> With a hint of weathering so popular in industrial styling, the Lonan Collection will fit into the rustic contemporary aesthetic that you look to achieve in your bedroom. Melamine laminate mimics the look of sun-bleached wood with a darker under-hue providing subtle contrast to the design of the group, with dark finished metal handles providing additional contrast. With a hint of weathering so popular in industrial styling, the Lonan Collection will fit into the rustic contemporary aesthetic that you look to achieve in your bedroom. Melamine laminate mimics the look of sun-bleached wood with a darker under-hue providing subtle contrast to the design of the group, with dark finished metal handles providing additional contrast.